It's Ola here and in the next five days I'm going to show you five cards made in five days for WOW embossing powders. 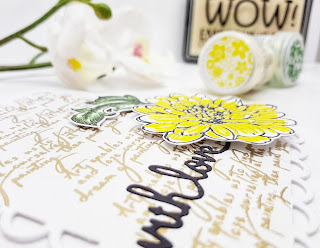 This months challenge is all about flowers, so, for my next five card and video tutorials, I will be using WOW products to create floral theme cards only . For my first card, I have decided to create a card with technique that I call ''Colour in with WOW''. Yes, that is correct. 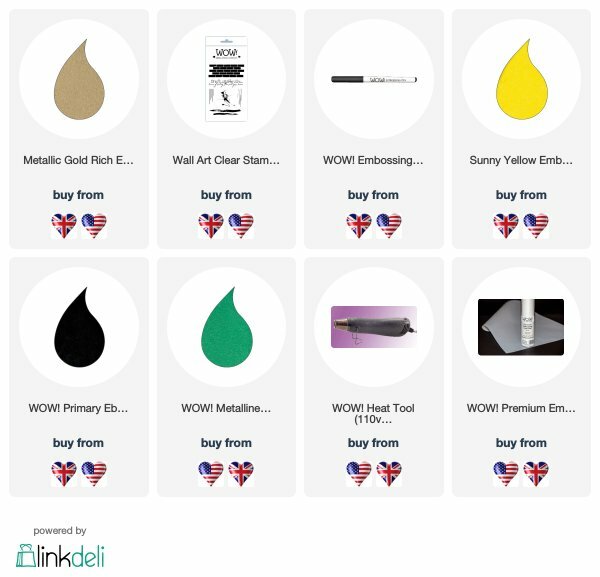 I will be using a WOW embossing pen to colour in my stamped image. In order to create this card you will need an embossing pen and pad, embossing powder and floral stamp. For the step number one I die cut rectangular scalloped edge frame and covered edges with masking tape. I done this in order to created background only in the center of my die cut piece. I have used script stamp from ''Wall Art'' stamp set by WOW embossing. I have stamped and embossed my script text with Gold Rich embossing powder and moved to the next step is to create flower and leaf. 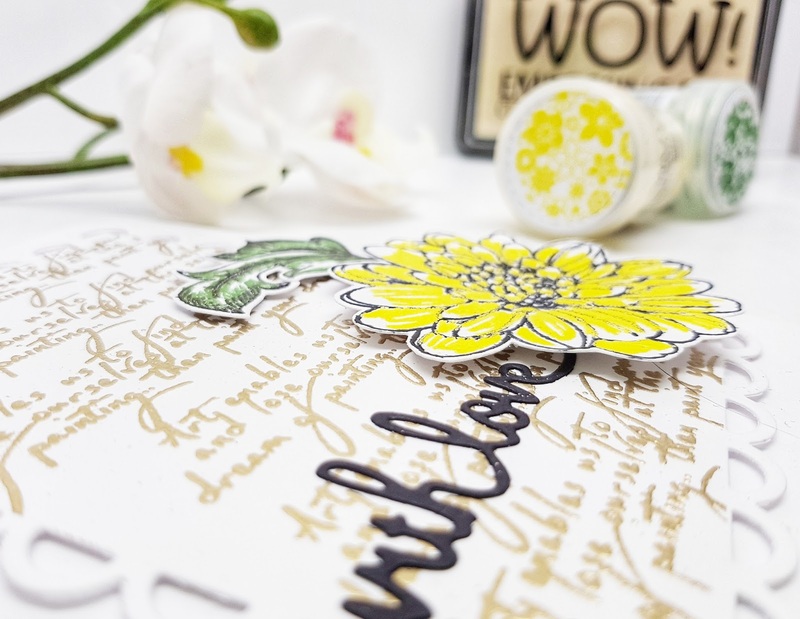 For my flower and leaf I have selected stamps from the latest Craft Magazine and stamped with Ultra Slow drying embossing pad and emboss with the Ebony black embossing powder. I have used WOW embossing pen and brush stroke movements to colour in edges and centers of the leaf and the flower. 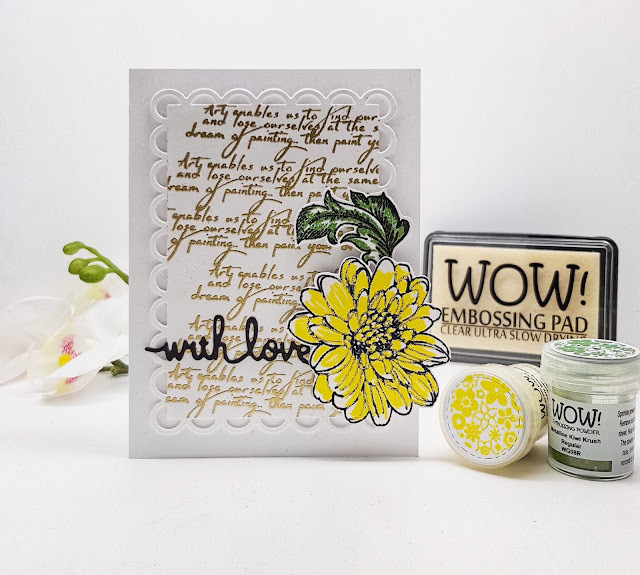 Then I have used Primary Yellow Regular embossing powder for the flowers and Metalline Green for the leaf and heat set it with WOW heat tool. I have mounted the embossed rectangular piece onto card blank and die cut sentiment ''With Love '' using black card stock. I have added flower and leaf onto my card using 3D foam to create some dimension and the card is finished. I hope you have enjoyed it and please don't forget to comeback tomorrow for card number two. Such a pretty card! But you tube link is not working.